Of the thousands of Utahns who walk through Gallivan Plaza or pass it on a TRAX train in downtown Salt Lake City every day, only a comparative handful ever met the man for whom it is named. 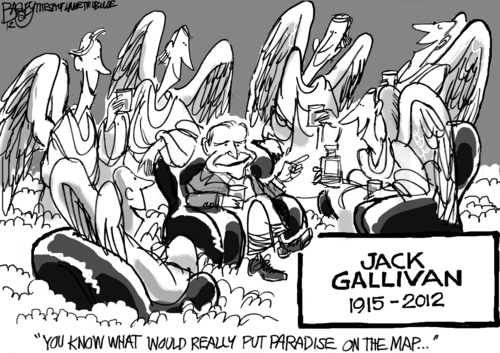 More's the pity, because John W. "Jack" Gallivan, publisher emeritus of The Salt Lake Tribune, was a delightful guy. He had a sparkling wit and a gift for storytelling. The Tribune staff called him Mr. Gallivan, not out of formality but out of respect. Those are not the reasons a downtown block was named for him, however, though they are among the reasons that his longtime associates at The Tribune will cherish his memory. Gallivan, who died Tuesday at 97, was a community mover and shaker whose vision, energy and advocacy helped to transform downtown and Utah. Among the many projects he championed was the building of the Salt Palace Convention Center, Abravanel Hall, the Salt Lake Art Center and the restoration of the Capitol Theatre. He was knee-deep in the creation of Park City as a ski resort and Salt Lake City's first, and admittedly quixotic, 1966 bid for the '72 Winter Olympics. He pioneered The Tribune's partnership in cable television systems in Utah and other states. In collaboration with editor Arthur C. Deck, he strove to provide the community with a reliable and respected newspaper of record. He viewed The Tribune as an agent for good in the community, an advocate for building up the state of Utah, and he put his shoulder to achieving that end. Gallivan, a descendant of the Kearns family, which owned The Tribune for nearly a century, inherited this philosophy from his mentor as publisher, John F. Fitzpatrick. Gallivan was groomed for the publisher's job early in his working career. He took the torch from Fitzpatrick at the former's death in 1960 and served until 1983, but his influence continued as the company's chairman. MediaNews Group acquired the paper in 2000. Fitzpatrick always acted in community affairs from behind the scenes. Gallivan took a much more visible role. He didn't always win his editorial crusades. He fought unsuccessfully in a famous ballot initiative to replace the state's minibottle and private club laws with liquor by the drink. He championed a single, unified municipal government for all of Salt Lake County. As he joked, a friend once observed that he seemed to do better when the LDS Church was with him. Gallivan's long life spanned nearly a century. His memory among the newspaper's extended family  the city he loved and worked so hard to improve  will endure even longer.